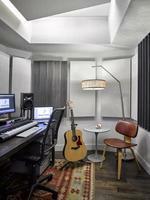 As a place of work and play, this office environment supports musical talents to create and relax. Thematic and eclectic lighting is balanced with standard and generic lighting to support the owner’s goal to create a feeling of a “non-office” office. The architectural goal was create a sense of openness with overlapping spatial boundaries and translucent edges. The writers and musicians are meant to move and congregate to places they feel comfortable to create. Designed on a budget, and short construction schedule, all the lighting design consisted of LED and Fluorescent equipment to meet the NYC Energy Code. 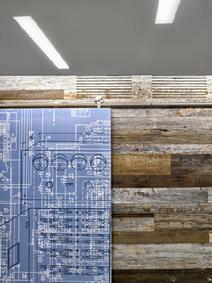 A reclaimed wood wall surrounds the entrance lobby, and linear illuminated ceiling slots in a random pattern to evoke notes on music sheet. The wood wall is grazed with light from concealed diffuse lights above within a reverse cove. A view towards the lounge shows the feeling of openness and light with a coffee bar on the right, and teaming desks flanked beyond. 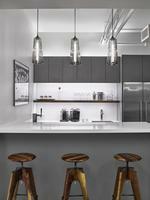 The coffee bar is illuminated by pendants, under cabinet task lights, and above cabinet lights for indirect illumination. It also transforms at night for cocktails. The lounge seating is eclectic with a lowered ceiling above, flanked by higher ceilings on either side, yet with the same horizontal illumination. A linear suspended pendant illuminates the teaming tables. The pendant contains T8 lamps for soft direct light, and T5HO lamps for indirect illumination. A suspended ceiling in the recording studios contains a bare lamp channel to provide indirect illumination. A floor lamp evokes a feeling of relaxation.